It’s with a heavy heart that I write this. Super Bowl LI Final Score- Patriots 34, Falcons 28. For a moment, it seemed like David might beat Goliath. The Falcons pushed to an early lead that they maintained till late in the game. 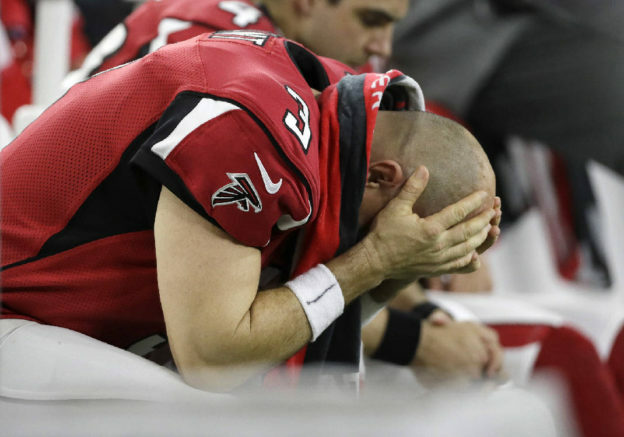 The Falcons defense, which had been a major concern for the team going in, not only managed to hold the Patriots down, but scored a touchdown themselves off an interception by Robert Alford. But then Tom Brady came to show that he can back up his reputation. In a comeback for the ages, he scored 25 points in the second half. This included four touchdowns and two much needed conversions. Ryan looked poised to put his team in field goal range and bring their lead up, but he was unexpectedly sacked and lost possession, leading to a fumble and recovery by the Patriots. With nearly no time left, the Patriots scored the second conversion and tied the game, leading to the first ever overtime in Super Bowl history. Sudden death rules apply- the first team to score wins. The Patriots won the coin toss and then beautifully brought the ball down the field. The Falcons defense, which had been so strong before, now faltered, and the Patriots fought their way into the endzone without losing possession. While I would have been much happier with a Falcons win, I’m not going to begrudge the Patriots their win. They played an amazing game in the second half. Even after being sacked several times, Brady kept his head strait and found openings in the Falcons defense to keep the ball moving forward. Edelman and White in particular proved invaluable with several incredible catches and drives respectively. I can appreciate good playing not matter who’s doing it, and it’s hard to feel too bad losing to a team that came together as well as the Patriots in the second half. In the meantime, Patriots fans, Falcons fans, and all NFL fans, you can continue to save 20%* on all NFL team mat colors, including custom mats.